Magic Touch Mechanical began providing HVAC service and products to clients in the Phoenix, Arizona area over twenty years ago. Back then not a lot of concern was given to the air quality in our homes. Today, it is a key concern for many homeowners and fresh air ventilation plays a key role in a healthy home. The concept of fresh air ventilation is simple: Using a device to exhaust old, stale, or contaminated air from the home, and introduce fresh outdoor air back in. While this sounds simple enough there are a few things to consider to do it properly. Cleaning the fresh air– Although, studies show outdoor air is less contaminated than the air in our homes, it still needs to be cleaned. The best way to achieve this is to bring the air through an air filtration system prior to circulation in the home. Tempering the fresh air– The other consideration is making sure the fresh air is conditioned (heated or cooled) prior to blowing it into the home. This is most often accomplished by the utilizing the homes central air and heating ducts. There’s a plethora of products on the market in the fresh air ventilation category – some work great, others not so much. There is also a definitive right and wrong way to introduce fresh air into a home and exhaust stale air. Unfortunately, our BPI Certified Building Analysts & Home Envelope Specialists see a lot of the latter. How Do You Know You Need Fresh Air Ventilation? Quite often the “tighter” (more energy efficient) homes have the poorest indoor air quality. Homes should meet or exceed a limited ACH (Air Changes Per Hour) requirement to assure good indoor air quality. This standard is published by ASHRAE (American Society of Heating, Refrigerating and Air-Conditioning Engineers). Magic Touch Mechanical’s Certified Energy Auditors utilize a machine that measures the number of air changes per hour in your home. Based on the test results, we determine if a home requires fresh air ventilation. If so, we develop a comprehensive plan to incorporate a fresh air ventilation system into the home. This is important to anyone with pulmonary disorders, allergy sufferers, and those at risk of developing a lung disease. However, we ALL should be concerned about making sure we and our family are breathing healthy air! There’s really no such thing as not needing to breathe the healthiest air possible. Considering the amount of time we spend inside our homes and workplaces, we have the ability to control our air quality! 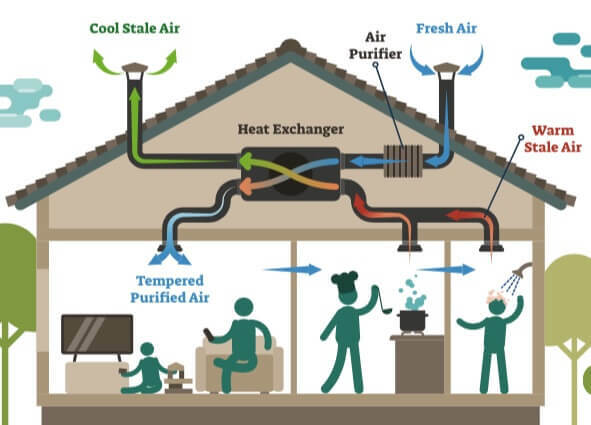 An ERV is a device that exhausts contaminated air while introducing fresh outdoor air into a home or building. They can be installed as a stand-alone product or utilize the homes existing central air duct system. ERV’s help to reduce the amount of humidity entering the home on especially humid times of year – like monsoon for those of us near Phoenix, AZ. Yes, non-Arizona’s…it’s not always a “dry heat”! An HRV provides regular exhaust and introduces fresh air to a home without the loss of heat you’ve already paid for. This is especially important in colder climates, and is accomplished via a heat exchanger. An ILV is not a stand-alone piece of equipment like its counterparts the ERV and HRV. Inline ventilators work by connecting to the existing central air and heating system ductwork in your home. What’s the Best Home Ventilation System? People who work in the healthcare industry have a saying “Prescription without diagnosis is malpractice.” We use this saying at Magic Touch Mechanical often as well. In other words, the first step is to “diagnose” the problem. If you went to the doctor with chest pains he or she wouldn’t prescribe a heart transplant – tests would be ordered. Upon knowing the test results, a prescription would be ordered that was specific to you and your body. This holds true for any HVAC (Heating, Ventilation, and Air Conditioning) system.